This landmark documentary reveals how top medical treatment plus ancient and modern healing techniques can help you succeed on the path of breast cancer recovery. It was created to teach women - and their loved ones - specifically how to strengthen the body, mind and spirit to rebound from illness...and thrive! Breast cancer is a very challenging illness, but healing and a cure are often possible! To inform and inspire women during Breast Cancer Awareness Month, Lionsgate Home Entertainment is releasing the 2-disc DVD guide, Breast Cancer: The Path Of Wellness And Healing , on October 2 on DVD and Digital Download for the first time. This landmark documentary reveals how top medical treatment plus ancient and modern healing techniques can help you succeed on the path of breast cancer recovery. It was created to teach women - and their loved ones - specifically how to strengthen the body, mind and spirit to rebound from illness...and thrive! The DVDs feature intimate and empowering stories from notable survivors including Sheryl Crow, Christina Applegate, Melissa Etheridge, Olivia Newton-John and Jaclyn Smith. This 2-disc set includes over five hours of key information including a two hour overview of diagnosis and treatment options, physical recovery, mental and spiritual recovery plus over 3 hours of bonus chapters with top experts answering over 100 FAQ's. Breast Cancer: The Path of Wellness and Healing will beavailable on DVD for the suggested retail price of $19.98. All profits benefit premiere breast cancer organizations including Breastcancer.org and UCLA's Jonsson Comprehensive Cancer Center. Notable breast cancer survivors join forces with America's premiere cancer doctors (including, Drs. Susan Love, Marisa Weiss, Dennis Slamon and Patricia Ganz) and wellness experts (including Drs. Deepak Chopra, Dean Ornish, Maoshing-Ni, Soram Khalsa and Kathy Smith, Kathy Freston, Marianne Williamson) as they share wisdom, insight and their true-life stories of hope and triumph! 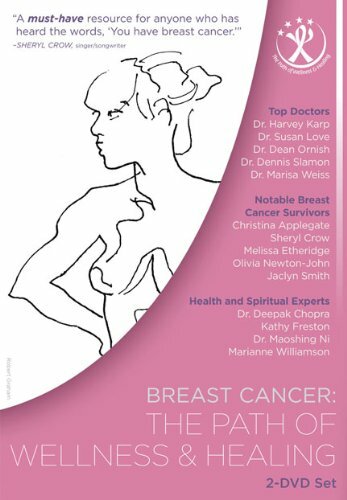 This inspirational guide explores the entire breast cancer experience blending breakthrough science with traditional and complementary healing. It helps women and their families navigate complex decisions about treatment and recovery with a mission to heal the whole person. Title of Copyright: (c) Copyright 2009 Montee Productions, ALL RIGHTS RESERVED.